Samsung’s presence at CES is always about wowing the crowds with its latest innovations and displaying the latest products. But as well as the established TVs, smartwatches and appliances, there will also be an opportunity to see the adventurous, unexpected new products coming to the fore in courtesy of Samsung’s Creative Lab (C-Lab). This year, they are revolutionizing skincare, changing playtime and a whole lot more. 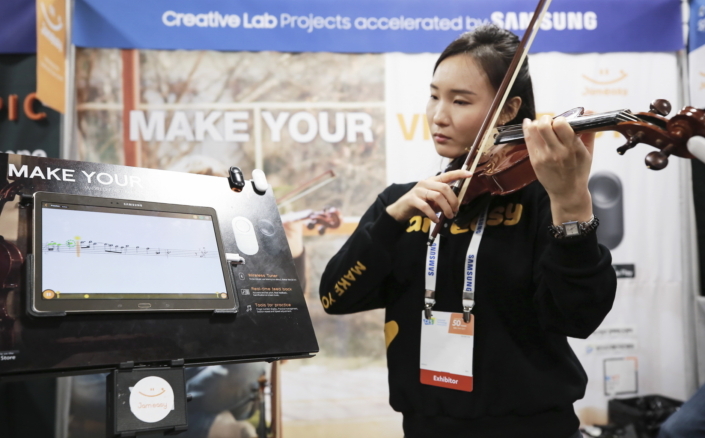 Samsung created the C-Lab in recognition of the creative, innovative and entrepreneurial talents of its own staff. It’s a program that enables workers to launch novel technologies that could go on to become a standalone success. Although these products are currently still in development, they already show a huge amount of promise. First up is Tag+, the product that will change the way that children interact with their toys. It’s a button-type device that connects to toys and a smartphone app through Bluetooth. Once paired, kids can click, long-press, shake or bump the smart tag to enable various responses from their toys. A click can access extra digital content for a toy, while a long-press could enable kids to share pictures of their latest Lego build, for example. 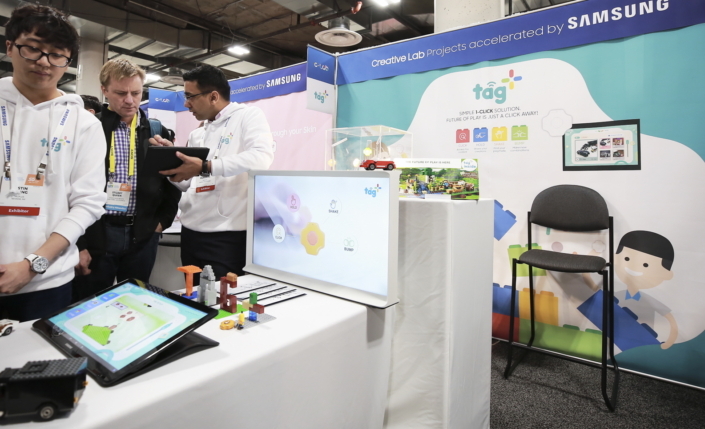 The developers created Tag+ to extend the life of toys everywhere by marrying digital and physical worlds. At CES, they are showing a live demo of the product and speaking with potential partners. S-Skin is one of two skincare products on show from the C-Lab this year. S-Skin saves on the time and cost associated with professional dermatological care. It consists of a microneedle patch and a portable device that analyses and cares for the skin. The patch can penetrate the skin to deliver effective ingredients and enhance absorption. The device can measure the hydration, redness, and melanin of the skin to provide customized skincare using LED light. The accompanying app saves details of the skin’s condition, making it possible to track changes over time. 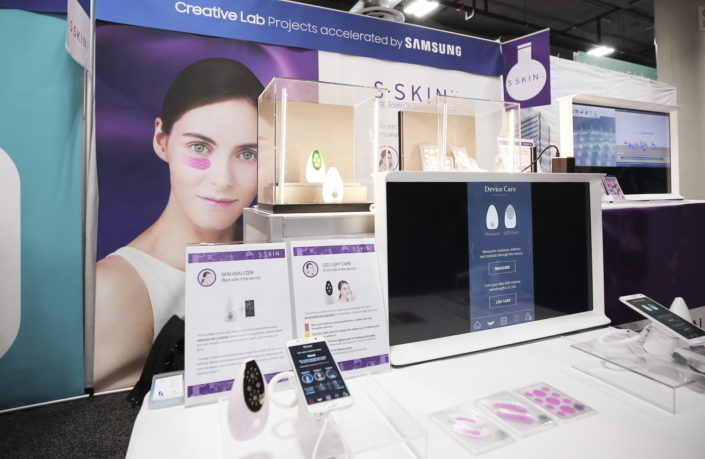 CES is a key opportunity for the creators of S-Skin to share their expertise. Another new product on display at CES is Lumini. 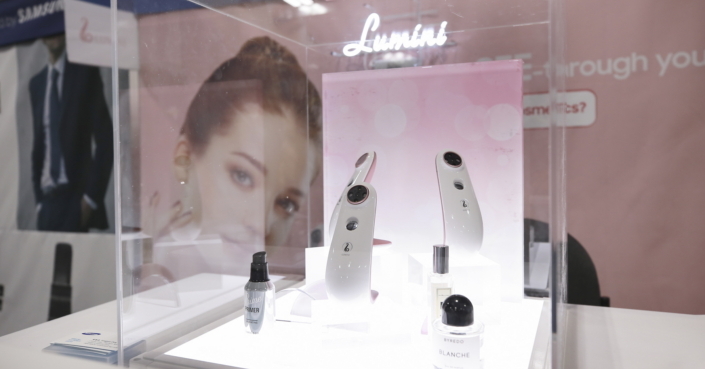 Lumini is a portable device that spots skin problems before they happen. It works by taking a picture of the face. The device analyses the information from the picture with its own algorithm and then sends the data to a smartphone app. The product identifies issues under the surface of the skin, like pimples, freckles, and redness. Lumini also recommends cosmetic products based on the analysis and provides a remote consulting service with a dermatologist or a skincare specialist. As well as showcasing the three new C-Lab innovations, other C-Lab businesses that have spun off are also having a presence at CES. Among them are MANGOSLAB’s Nemonic, a compact printer that prints memos from smart devices to sticky notes; Jameasy, a solution that helps users practice an acoustic musical instrument through a sensor module attached to the instrument; MOPIC, a smartphone cover that helps view 3D content without glasses; analogue plus, a hands-free device for helmet users; and WELT, a fashionable belt for healthcare. 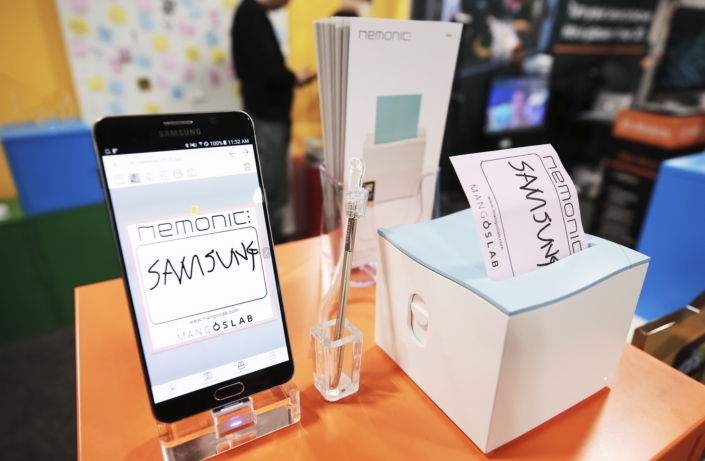 MANGOSLAB’s Nemonic is a compact printer that prints memos from smart devices on sticky notes. Jameasy helps users practice an acoustic musical instrument through a sensor module attached to the instrument. 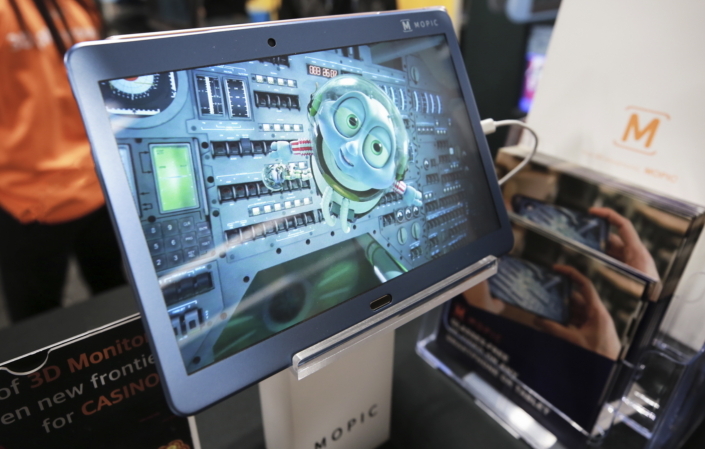 Through the use of a simple device that attaches to a phone much in the same way as a protective case, MOPIC enables 3D viewing on the go. No glasses necessary. The C-Lab initiative is a valuable opportunity for great minds to think freely and create something ingenious. CES is another chance for the businesses themselves to interact with the market. It will also enable them to gain priceless insights that will help shape their products.